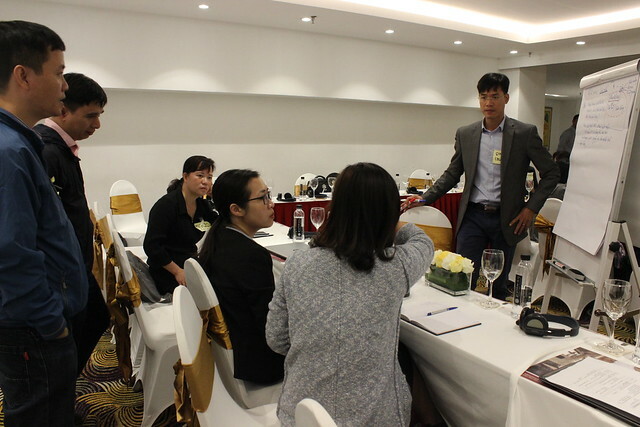 Researchers are exploring how ‘nudges’ could be used in influencing behaviour to improve food safety in the Vietnam pork value chain. Based on the nudge theory, ‘nudges’ are interventions with a low level of intrusiveness on personal choice that can be used to alter the behaviour of people, in this case value chain actors in the pork value chain. 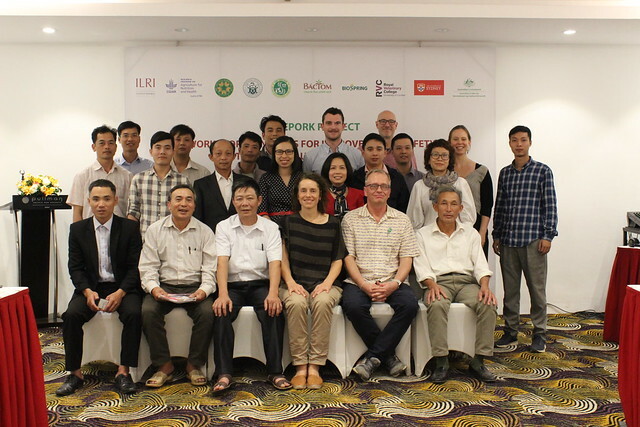 In a workshop of the ‘Market-based approach to improving the safety of pork in Vietnam’, or SafePORK project on 27 November 2018, 40 animal health experts from the Royal Veterinary College (RVC), the International Livestock Research Institute (ILRI), the Vietnam National University of Agriculture (VNUA), the Hanoi University of Public Health (HUPH), the Vietnam National Institute of Animal Science (NIAS), the Australian Centre for International Agricultural Research (ACIAR) and other stakeholders discussed how the theory could be applied in SafePORK project sites. 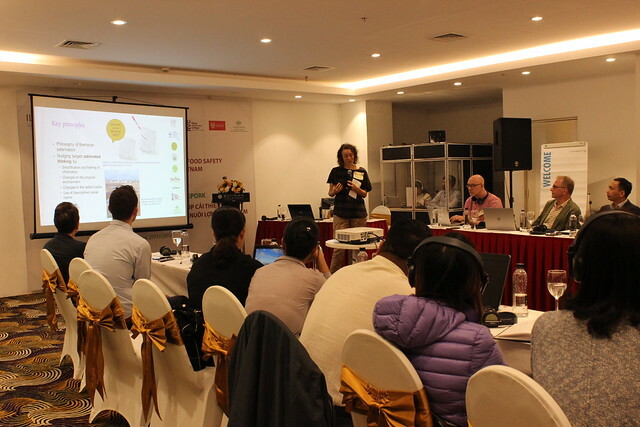 RVC researchers Barbara Haesler and Mathew Hennessey (who co-led the workshop with ILRI researchers) said experiences from Singapore suggest that nudges could be used encourage specific actors along value chains to change practices while not limiting their choices or economic incentives. Researcher from the Royal Veterinary College, Barbara Haesler, introduces the nudge theory to participants (photo credit: ILRI/Chi Nguyen). Slaughtering pigs on an inox/stainless steel tables or grids rather than on floors. Providing clean and disinfected cloths to slaughterhouses and pork shops. Separating clean and dirty slaughtering zones. Retailers, consumers, and workers from slaughterhouses joined the afternoon session. They discussed various posters with awareness raising messages aimed at changing pig slaughter and handling practices. For example, the retailers group was shown messages on the need for washing hands and equipment when handling pork. Participants reviewed the messages and said they should be simplified and that the posters should have pictures rather than illustrations. 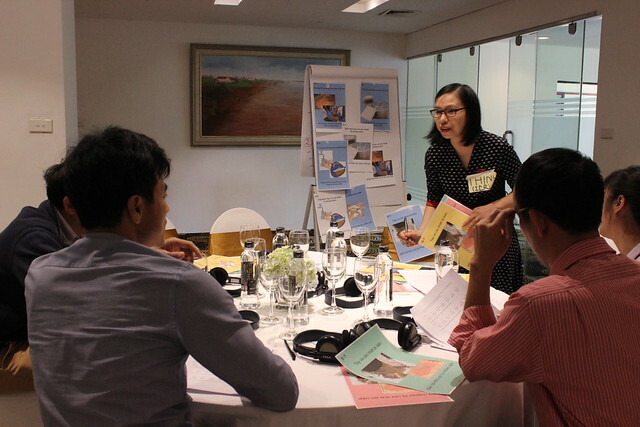 By the end of the workshop, different value chain actors selected their preferred messages and visualized posters that will be consolidated and used by the project team in communication. The SafePORK project is led by ILRI and funded by ACIAR. Tags: Nudges workshop, RVC, SafePORK. Bookmark the permalink.